America's favorite horse treats just got better! Our new, small wafer size is ideal for training or rewarding as it conveniently fits in your pocket. 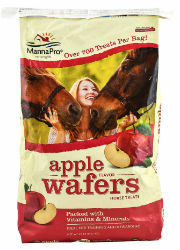 Manna Pro Apple Wafers are so delicious, your horse won't be able to resist the taste. See why horse owners prefer our new pocket sized wafers 2:1! A great value with over 700 treats in each 20 lb bag!